Darren Rowse is the admin of this blog and has influenced many persons like me to make blogging as a career. His practices are appreciated by all. He is a full time blogger and earning handsome money from his blogs. He also gets more than 50 comments for each single post. All he has done through his experience. So I decided to take a look at his posts and has come to conclusions that I will share with you and also apply to my blog. Everyone is aware of their writing skills and content that engage the visitor. But they also use some magical words at the end of the post which persuades the visitors to write comments for them. Check this example of Problogger. Now see at the end of the blog post he is asking a question from his visitors and encouraging users for comments. He smartly asks for user suggestions and psychologically striking the users' mind for writing comments. It is very smart from Darren Rowse. It is his experience that we can see on his blog. So what you learn from this popular blogger. Here I tell you what you and I should do. Always ask a question of your visitors. The question should be related to the topic as Darren Rowse did. Ask for user experience for the topic. If I am his visitor than I will surely change my mind about leaving the blog and write a comment for him. So this is a simple but smart technique that convinces user to write a comment for the blog post. Neil Patel is the administrator of this blog. He also owns a company and has for many top corporations. Now when it comes about SEO tips then no one can give you better than Neil Patel. He is a master of it and worked for techcrunch, amazon and many others. He also gets more than 100 comments for each blog post. This is because of several reasons. First, he always writes new and rich content. I am a big fan of his writing skills. Now see what he does and how he persuades users to write comments for his blog post. See he wrote a post about corporate blog and the same way he also asked a question from his visitors like what is your thought on a corporate Blog? Question mark always works at the end of the post it strikes the visitors mind to write comment. So one thing is clear from above two examples always ask questions but remember it should be related to your topic. So what you and I should do and learn from quicksprout. Always ask questions at the end of the post. The question should be related to your topic. Tell visitors that you are convinced and add a link that relates to the topic. Ileane Smith is the admin of this blog and it is a very popular blog among blogger community. And also a great platform for guest bloggers to get more exposure. She writes on blogging tips and I am a big fan of her blog. Actually I love every popular bloggers because you will always learn something new from them which is good for your business. Like today I and you are learning how to convince users to write comments for a blog post. So lets see what she has and how she gets a large number of comments. Isn't it a smart tip. So lets see what I and You should do to get more comments for each post. Ask, ask and ask question related to your topic. Give gaps in two sentences To gain more user attention. Style italic to your questions. Ana Hoffman is the admin of this blog. A very popular blog for those who wants to increase search engine traffic. She has a unique blog and writes in a very professional but simple language. You will not see a better blogger branding than Ana Hoffman. Know how she made her blog like a brand. Read it here. If you want to get more search engine results then you should visit her blog. And because of her knowledge and awesome blog she also gets many comments for each post. 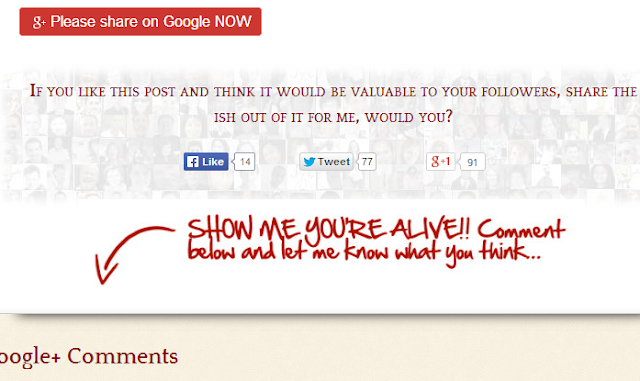 So lets see what she does and how she convince and persuades visitors to write comments for a blog post. She is one more step ahead than everyone else. See till now we saw popular bloggers like Neil Patel, Darren Rowse and Ileane Smith were asking questions about the topic from their visitors but Ana Hoffman of trafficgenerationcafe is one more step ahead then them. She is not only asking for comments but she is asking to plus one to her post by adding "please share on google now" button. How smart and professional she is and she deserves to be the admin of a successful blog. Again she used a funny image at the end of the post that says "let me know what you think". Wow what a perfect and best way to convince visitors and users to write comments for a blog post. She completely persuaded me to write comment for her. Style your fonts in a different way that asks for writing comments. Final Tips from Popular blogger To convince and persuade visitors to write comments for a blog post. Asks questions at the end of the post. Questions should be related to your topic. Tell people that you are convinced Like Neil Patel did. Add a related topic link at the end like all. Add a google plus button at the end like Ana Hoffman did. Make your fonts stylish and different that asks for comment like Ana Hoffman did. Give gaps between questions and try to get more user attention. Make your questions italic like Ileane Smith did. So these were all the best tips from popular bloggers that I could provide you to persuade and convince visitors to write comments for you. These are just my thoughts on this topic - I would love to hear you. How do you convince your visitors to write comments for your blog post that people write on your blog ? Description : How Popular Blogger Like Darren Rowse, Neil Patel, Ileane Smith and other persuade visitors to write comments on their blog post.